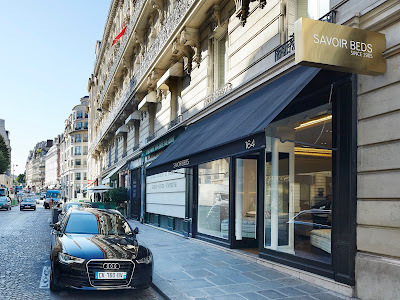 Savoir Beds: Savoir Beds Paris - new imagery! Savoir Beds Paris - new imagery! As you may now know, we've opened our beautiful new showroom in Paris. Based in the heart of Paris’s luxurious shopping district. Set on the exclusive rue du Faubourg Saint Honoré, the new store is located on one of the most sought after streets in the capital! As you will see in these fabulous new photographs of the space, the boutique dates back to the mid-19th century and spans across two floors - refurbished with its’ stunning original features intact. These renovations include beautiful, ornate ceiling mouldings and the repair of a sweeping wrought iron suspended staircase (below) which acts as a main feature in the store. What do you think of our new home? If you are in Paris and would like to visit, we are on: 164 rue du Faubourg Saint Honoré, 75008 Paris. Or, give Laila, our showroom manager a call on: + 33 (0)1 44 43 83 65. Last year we have seen the pastel colors influencing the designing world. Even in the fashion industry, pastel colors were the trend. But in recent days things have changed. This year designers are choosing bright colors. Dark colors of red, yellow, green, blue etc. have now mostly liked by the designers. This trend is also seen in the field of interior designing. Now, homes are arranged based on bright color themes. Every object in the rooms including the curtains, furniture, and the paintings will be color coordinated. Giving a theme to the interior decorations will help to make the rooms look even more beautiful. Now more people are giving much importance to fashion. They are hiring separate designers to design their interiors. These designers will design the rooms based on the personal taste of the owners. Your blog is doing a great job by giving us the latest trends in the interior designing world. This is very helpful for people to follow the latest style. If the interior elements are not designed correctly, our rooms may look dull and dark. Here details of each and every element are given in a good manner. So people can develop a good idea about the latest trends in designing. Thanks for your blog posts. I always try to read your blog. Each post that is given in this blog is very interesting. It makes us wait for more posts. Keep continuing your job. We readers expect that your next catchy post will be published very soon. Any students, who are looking for a good writing service, please pay attention. Best essays written by skilled writers at an affordable price will be given at the online essay service. You can visit the website of this essay writing service to obtain help for your college essays.